The Yardbirds Television appearances, does audio exist? 7. 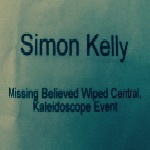 Geordie Beat Sunday 27 September 1964 Missing Which TV Station transmitted this please? 12.Thank Your Lucky Stars ABC 19 June 1965 Banned from the show after turning up late for rehearsals! 20. Gadzooks! BBC2 26 September 1965 Yardbirds (pencilled in)? 23. Top Of The Pops BBC1 Thursday 30 September 1965 Yardbirds (pencilled in)? 30. Ready Steady Go! Rediffusion 1965 I'm A Man - Anyone know the precise date of this episode please? For Your Love, which was released on 5 March 1965. Hard to believe, so the above list is possibly incomplete? 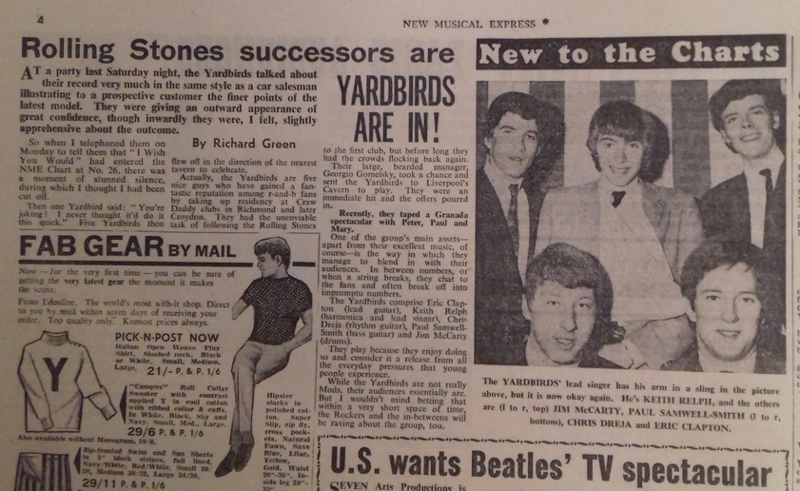 Help with general background information on The Yardbirds please. 1. From which town or city did the group originate? 2. When did they form? 3. What was the original line-up? 4. When did Jimmy Page join? 5. When did Eric Clapton join? 6. When did Eric Clapton leave? 7. When did Jeff Beck join? 8. When did the group end? 9. 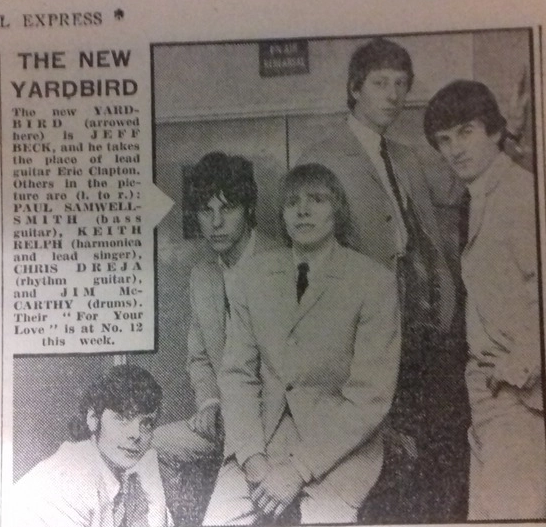 Is there a story behind the name Yardbirds? There is a feature in this month's Uncut magazine on the making of For Your Love. Graham Gouldman(who wrote the song) mentions watching them perform the song on Top Of The Pops. Needless to say Eric Clapton wasn't interviewed for the piece! Hi William, I don't have access to all my research right now but they definitely did some TOTP to promote For Your Love. They def. did some RSG's with Clapton too, I think he left in March 65 ? Your entry no.4 Fourth National Jaxx Festival BBC 1 Saturday 8 August 1964 10.15 - 11.15 pm From Richmond Surrey Missing. To the best of my knowledge they did not appear in that programme. There is no contract for it in their BBC Artist File and off the top of my head I'm 99% sure I checked the programme log for that show precisely because it was said that the Yardbirds appeared. I could well be wrong on that but I'm pretty confident. I think there is a tape of them at that show (?) but I don't believe that it originates from a BBC broadcast of that appearance either from radio or TV. Many of those shows are mimes (TYLS, Cool Spot etc.) so not much of a loss in a way, at least in terms of audio. Several Ready Steady Go appearances are around as off air audio. Cool Spot tx 7/7/64 was pre-recorded on 25 June, The Yardbirds mimed I Wish You Would and A Certain Girl. Open House - did not appear on 8 August 64 - prob. combination of the Richmond Festival and Relf's illness (?). Open House 5 sept 64 they played live doing Little Queenie and I Can Tell. Top Beat 9/12/64 rec. 7/12/64 they played live - Here T'is (lasting 4.10). They didn't play at the Nov 64 concert / broadcast. Gadzooks was not tx on 26 Sept 65, it was the 27th but no Yardbirds (did have Manfred Mann and Bo Diddley though). I'll do some digging on the other stuff when I get the chance. I'm sure Peter can chime in ! TOTP For Your Love, there are contracts for 18 March, 25 March, 1 April and they Ampexed an appearance on 7th April, presumably for the 8th April 1965. These would all be For Your Love but the Popscene website could confirm this. There is also footage of Bob Dylan watching the Yardbirds on TV in the UK in 1965. Their last TOTP appearance was in Nov 1966 with Happenings Ten Years Time Ago. It's listed as "It's the Geordie Beat" and no surprise that Tyne Tees showed it (7:28-8:25pm), presumably it was a Tyne Tees production. The other regions who took it that Saturday evening (same time slot) were Anglia, TWW (and WWN), Border and Ulster. "Now" 4 March 1966 is another Yardbirds TV appearance I think. TWW show. "That's For Me" 1 Feb 1965 Rediffusion show.